The Road Less Traveled? Not Since Waze Came To Los Angeles : All Tech Considered The traffic app Waze reroutes drivers from busy, clogged streets to areas with less traffic. 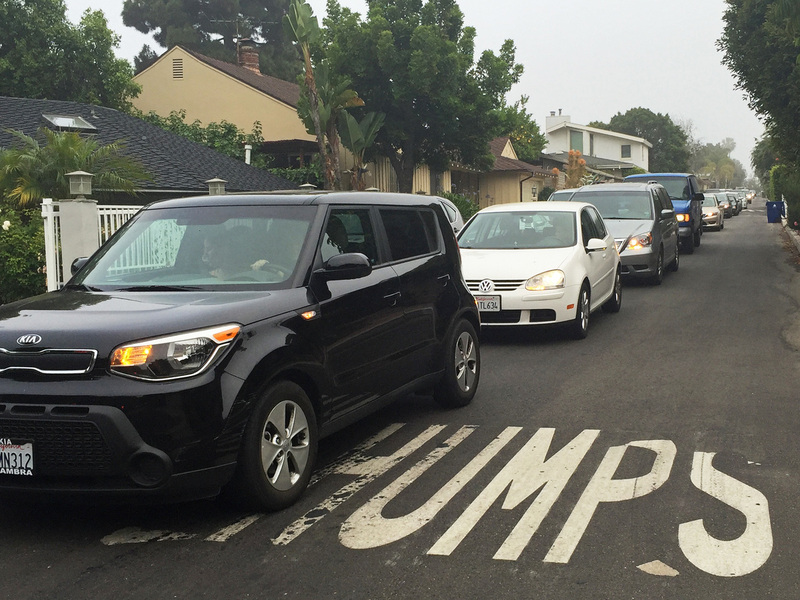 But that means some once-quiet neighborhoods are beginning to see traffic jams. Waze is a traffic app that relies on users' feedback about road conditions to find the quickest possible route. Leon Sturman lives in Sherman Oaks, near the top of a hill that separates the San Fernando Valley from West Los Angeles. His is a narrow, winding street typical of the canyon neighborhoods that usually provide a haven from the buzz of urban life. It runs parallel to one of the most congested corridors in the country: the 405 freeway. By 7 a.m., though, Sturman's street begins to resemble that freeway. "Take a look down the block," he says one weekday morning. "How many cars are there? Thirty cars already just waiting as far as the eye can see." The gridlock is a recent phenomenon, says Preet Dhillon, who grew up on this street and lives next to Sturman. She attributes the backup to one factor in particular: Waze. 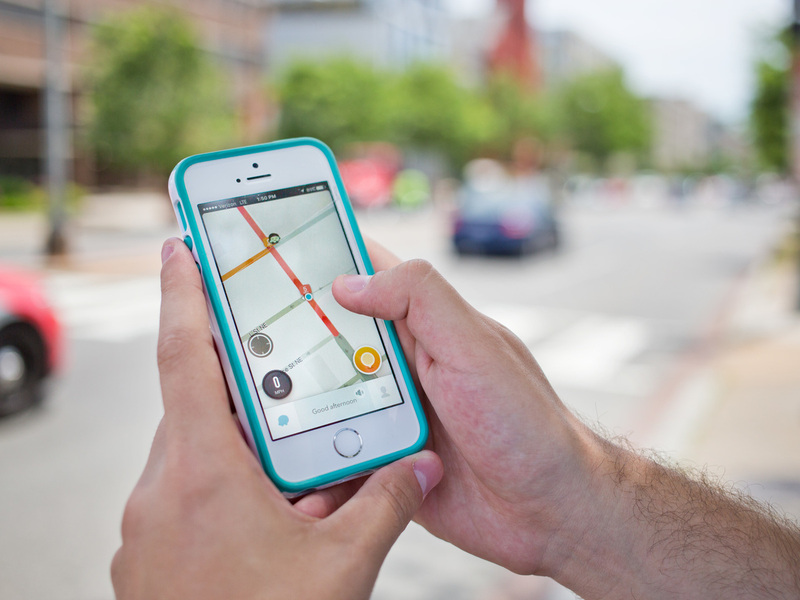 The GPS-enabled navigation app uses crowd-sourced traffic data from some 50 million users to find drivers the quickest possible route. It's no surprise the idea has been embraced in traffic-choked cities like Los Angeles, which boasts almost 2 million users — the app's biggest market in the U.S. Similar apps like Google Maps weigh various factors when generating routes, from traffic conditions to distance and trip complexity. Waze, on the other hand, prioritizes avoiding traffic. That's earned it a reputation for sending users on twisty-turny routes through neighborhood back roads, like in Sherman Oaks. "Technology's a great thing but I don't know what you do in situations like this," Dhillon says. She and Sturman both say they had to change their schedules to avoid the new morning rush. Sturman now has to move his car from his garage to the street at 6 a.m., before the hordes arrive, or else backing out of his driveway becomes an ordeal. The traffic issue may be bigger than personal inconvenience, though. "What if there's a fire engine one day, or what if there's a serious matter?" Dhillon says. One city councilman proposed pressuring Waze to change the way it routes traffic to avoid small neighborhood streets. Meanwhile, residents like Dhillon in affected areas have pushed the city to block off access with no-turn signs or speed bumps. Some users even falsely report crashes in their area, to divert drivers away from their streets, a tactic that Waze has begun to fight against. Representatives from Waze declined to comment for this story. But the tech company does share data with the LA Department of Transportation, which is less convinced of the app's impact. "I can't say [there's] any one reason for an increase in cut-through traffic," says department spokesman Bruce Gillman. And Gillman says even if the app could be changed or roads blocked off, the underlying traffic problem isn't going anywhere. "Apps that help people get around traffic and detours, and traffic on freeways, etc., may be new, but cut-through traffic is definitely not new and it's certainly not new in Los Angeles," he says. In fact, Valley resident Dustin Ma has been cutting through back roads to avoid the 405 for years. Now he drives for the ride-hailing service Lyft and depends on Waze when his old shortcuts are backed up. "It opens up considerably more options," Ma says. "Everywhere is a nightmare so I'm just trying to shave minutes or time." Although Ma empathizes with locals' frustration, he says the situation was inevitable. As long as there is traffic, there will be drivers looking for a way out. "If it wasn't Waze, it would be a Google Maps or it would be some other GPS platform that would come up with this," Ma says.